The Scarlet Witch (Wanda Maximoff) is a fictional comic book Character that appears in books published by Marvel Comics. The character first appeared in X-Men (March 1964) and was created by Stan Lee and Jack Kirby. She is the daughter of Magneto, the twin sister of Quicksilver, and the paternal half-sister of Polaris. Debuting in the Silver Age of comic books, the Scarlet Witch has been featured in five decades of Marvel continuity, starring in two self-titled limited series with husband the Vision and as a regular team member in superhero title the Avengers. The character has also appeared in other Marvel-endorsed products such as animated films; arcade and video games; television series and merchandise such as action figures and trading cards. 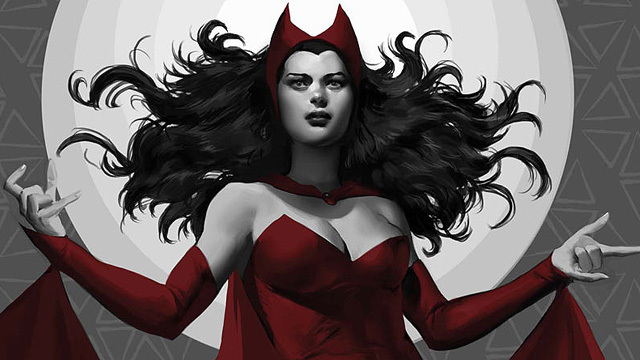 The Scarlet Witch was ranked 97th in Wizard's "200 Greatest Comic Book Characters of All Time" list and 14th in Comics Buyer's Guide's "100 Sexiest Women in Comics" list - More about Scarlet Witch Character Review...keep reading !! 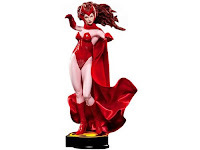 The Scarlet Witch is a mutant who had the ability to manipulate probability via her "hexes" (often manifesting physically as "hex spheres" or "hex bolts"). These hexes are relatively short range, and are limited to her line of sight. Casting a hex requires a gesture and concentration on her part, though the gestures are largely a focus for the concentration and despite this precision, the hexes are not necessarily guaranteed to work, particularly if Wanda is tired or using her powers excessively. If overextended, Wanda's hexes can backfire, causing probability to work against her wishes or to undo previous hexes. Early in her career, her hexes were unconscious on her part, and would be automatically triggered whenever she made a particular gesture, regardless of her intent. These hexes would only manifest "bad luck" effects. She later gained enough control over her powers that her powers only work when she wants them to, and they are not limited to negative effects. She can use her hexes to light flammable objects, contain or remove air from a particular volume, deflect objects, stop the momentum of projectiles, open doors, explode objects, create force fields and deflect magical attacks, etc. The effects are varied but almost always detrimental to opponents, such as causing the artifact the Evil Eye to work against inter-dimensional warlord Dormammu, the robot Ultron to short circuit, or a gas main underneath the Brotherhood of Mutants to explode. Wanda is an expert combatant having been trained by both Captain America and Hawkeye, as well as being an adept tactician due to her years of experience working as an Avenger and her experience in a variety of combat situations. 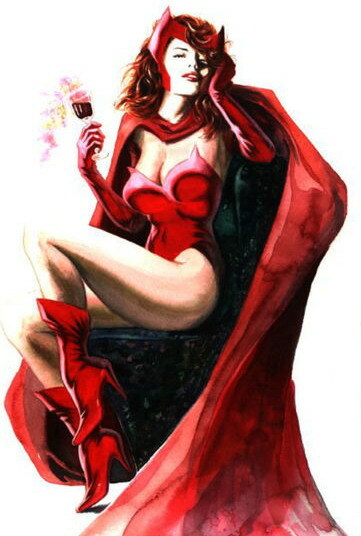 The Scarlet Witch also has the potential to wield magic and later learned that she was destined to serve the role of Nexus Being, a living focal point for the Earth dimension's mystical energy. 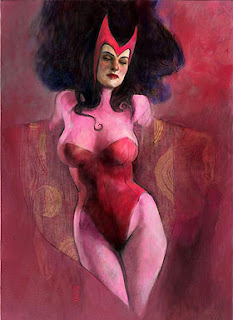 Writer Kurt Busiek redefined the Scarlet Witch's powers, and maintained that it was in fact an ability to manipulate chaos magic, activated when she was born. Busiek's redefinition upgraded Wanda's powers substantially, and she is shown as being capable of feats such as the resurrection of Wonder Man. She was here described as the "nexus being" of the Marvel Universe, capable of birthing children powerful enough to challenge avatars of Eternity. Writer Brian Michael Bendis revamped Wanda's powers yet again, with Doctor Strange stating that there was in fact no such thing as chaos magic, and that Wanda had been altering reality all along. Her power was here depicted as sufficient to rewrite her entire universe, and cause multiverse-threatening ripples. When the Elder god and primeval demon Chthon was summoned to Earth Dimension by the power of the Darkhold and took Quicksilver as his host, he revealed that there is in fact Chaos Magic, a form of magic so dreaded and horrific that all of Earth's sorcerers made a pact to end Chthon's reign with a lie, that there is no God of Chaos and no Chaos Magic which is the basis for Chthon's unholy might. Later on after Chthon was exorcised from Quicksilver, he mentioned that he found in the Darkhold a leading text on Chaos Magic, the power which he believes is the source for his sister's insanity. Wanda's power to alter reality was spawned from the combination of her natural mutant abilities to affect probability and Chaos Magic. Because of the nature of her powers, she does not possess certain limitations like other reality warpers such as Mad Jim Jaspers who needs existing reality to use his powers. Her powers which stemmed out from the ability to manipulate probabilities suggest that she does not need existing matter to warp reality, only possibilities which are endless. It must also be noted that the Scarlet Witch is responsible for the resurrection of Mad Jim Jaspers which happened when her powers altered reality. She also has a degree of resistance to the Phoenix Force and can also cause pain to its hosts, such as Cyclops when he tried to stop Hope from going with her. Although this becomes less effective as the Phoenix Force portions are divided among those who have not yet been defeated. A vs X #12 confirmed that her powers involve chaos magic, and stated that she has "Mutant Magic", and the "primal source of her chaos" magic is cosmic. 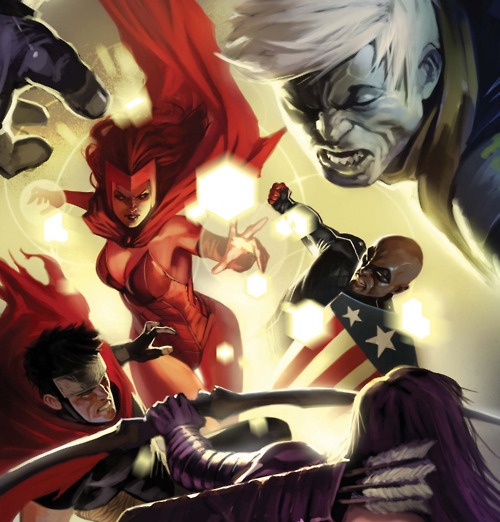 In May 2013, Entertainment Weekly reported that the Scarlet Witch and her brother, Quicksilver, would appear in the 2015 Avengers sequel (the Avengers 2).